Chubb's (CB) roots date back more than 100 years ago, and the company merged with ACE in a $28.3 billion deal that closed in January 2016. This deal created the sixth-largest U.S. property and casualty (P&C) insurer by premiums and brought together two conservative insurers with highly complementary business lines – ACE was more international and focused on large commercial accounts, while Chubb was stronger with middle-market companies and personal lines businesses. Today Chubb is very diversified and provides commercial and personal property & casualty insurance, personal accident & supplemental health insurance (A&H), reinsurance and life insurance to a wide range of clients. The company writes gross premiums of over $36 billion, 65% of which come from commercial property and casualty lines and 35% from consumer lines, including life insurance. On the commercial side, Chubb is a dominant middle market and small commercial insurer primarily distributed through agents, combined with a leading large industrial commercial and specialty lines insurer distributed through brokers. On the consumer side, Chubb is a major personal lines writer, serving customers ranging from affluent to mass market. Some of its offerings for individuals include protection for their homes, personal goods and valuables, and life and health insurance. Both of Chubb's commercial and consumer businesses operate globally. By geography, the company writes approximately 63% of its net premiums in the U.S., 13% in Europe, 11% in Asia, 8% in Latin America, and 5% in Bermuda and Canada. Chubb possesses several enduring competitive advantages, beginning with the sheer size of its business. Insurance policies generally have little differentiation, which makes price an important selling factor. Thanks to the company’s massive base of premiums, Chubb can spread its operating costs over a wider pool of customers to lower its policy costs, diversify its underwriting risk, and offer customers packaged policies that cover a number of types of insurance (Chubb has one of the largest product portfolios in the global insurance industry). Chubb has built leadership positions across many of its product lines, reinforcing its scale advantages across different insurance markets. In the U.S., Chubb is the No. 1 provider of personal lines coverage and service for affluent customers. The company is also the largest commercial insurer in the U.S. and the leading writer of crop insurance for farmers. Globally, Chubb is the leader in professional lines, including directors and officers (D&O) and errors and omissions (E&O), and a top provider of personal accident and supplemental health insurance (A&H) for consumers. While certainly important, scale is not enough for an insurance company to be successful over the long term. As Chubb noted in its 2017 annual report, the company practices "the art and science of assuming and managing risk, and our insights are constantly improving as data and analytics combine with a culture of discipline and oversight." Simply put, an insurer that is built to last must do an excellent job underwriting conservative policies. If risk is not priced accordingly, a series of unfortunate catastrophe events has the potential to inflict serious damage. Chubb's underwriting track record is outstanding, as demonstrated by its combined ratio. The combined ratio measures an insurer’s costs and claims as a percentage of the total premiums it has written. A ratio below 100% means that the insurance company is generating a profit from its policies and has been smart about the risks it is willing to write policies for. Chubb combined ratio has remained below 100% every year since at least 2005, in part thanks to the company's willingness to sacrifice market share in order to maintain an underwriting profit. Such discipline is especially important during turbulent market conditions. In 2017, hurricanes, wildfires, and earthquakes resulted in a near-record year for worldwide insured natural catastrophe losses. While these events cost Chubb about a third of its annual earnings, the company's combined ratio still remained below 100% (94.7%). Simply put, the losses remained within the company's risk management expectations. 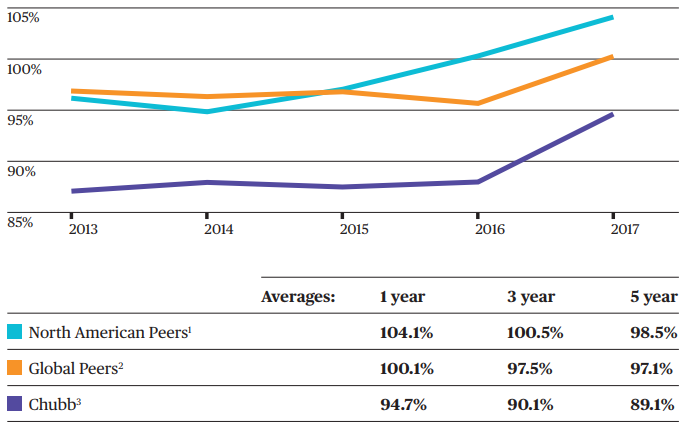 As you can see below, Chubb's underwriting results have consistently outperformed the averages of its North American and global peers over the last five years. To really put Chubb's underwriting performance in perspective, consider that the average combined ratio of the U.S. property and casualty industry was over 102% from 1951 through 2016. In other words, the typical insurer’s underwriting is often unprofitable, forcing them to depend on positive investment results to turn an overall profit. Besides Chubb's economies of scale, leading market positions, and underwriting discipline, the company's diversification is another advantage. As previously discussed, Chubb has its hands in many different lines of insurance. As a result, when one business is down due to economic conditions, another is up somewhere else in the world. For example, if an area of commercial P&C is under pressure due to market conditions, one of Chubb's less cyclical businesses could be enjoying profitable growth like accident & supplemental health insurance, personal lines, or small commercial. Since 2005, Chubb's discipline and diversification have helped it navigate three $100 billion-plus catastrophe loss years for the industry to grow its per share book value at compound annual rates considerably greater than those of its peers. Looking ahead, Chubb's focus can remain on further improving its core strengths now that merger integration work with ACE is complete. By almost every measure, the deal has been a success thus far. Chubb achieved $975 million annualized run-rate expense savings by the end of 2017, representing more than three percentage points of annualized combined ratio benefit. Importantly, these savings came one year ahead of schedule and were well ahead of Chubb's original synergy target of $650 million. Chubb has numerous opportunities for organic growth as well. For one thing, the company has a leg up on smaller rivals due to its established distribution networks and massive number of field agents to sell its policies. Chubb’s history dates back to the late 19th century, which has provided it with over 130 years of time to build out its distribution network, develop increasingly intelligent risk models, and establish a well-known brand recognized for quality service. New competitors would need years of time and millions of dollars to catch up. The global P&C market is also about $2 trillion in premiums, and Chubb only has $36 billion of it. In other words, the company's market share is just 1.5%. Chubb has a long runway to continue growing its business, and management is focused on further diversifying the business, including product areas, customer segments, and local presence globally. Outside of underwriting activities, Chubb's future growth will also be tied to the results of its substantial investment portfolio, which generated over $3 billion in net investment income in 2017. Specifically, Chubb is investing what's known as insurance float. Float is the money an insurance company holds onto between the time customers pay premiums and the time they make claims on their policies. Insurance companies invest float into income-producing assets such as bonds and stocks to generate profits in addition to their underwriting activities. Chubb's conservatism is evident once again with how the company structures its investment portfolio. At the end of 2017, Chubb's investment portfolio was worth $102.6 billion. Over 90% of its portfolio was invested in publicly traded fixed income securities with an average investment grade credit rating of A from S&P. In other words, the income generated by Chubb's portfolio is extremely safe, and its returns shouldn't be affected much by performance in the stock market (equity securities account for less than 1% of the portfolio's value). While a 100 basis point increase in interest rates is estimated to reduce the value of Chubb's fixed income portfolio by $4.1 billion (rates rise when prices fall), higher rates would actually help Chubb's cash flow. The company holds almost all of its fixed income investments through maturity (average duration of 4.2 years), so Chubb gets paid back in full and can reinvest proceeds in similar securities offering higher yields. Overall, Chubb is one of the most discipled and conservative insurers in the world. The company seems likely to continue growing its business at a moderate pace over the years to come while rewarding investors with steadily growing dividends. While ACE’s combination with Chubb in 2016 was a huge deal, it also wasn’t ACE’s first rodeo. The company had successfully acquired and integrated over 15 businesses in the past, including numerous multibillion-dollar deals. As Chubb continues its third year of operations with ACE, the bulk of the integration is now behind the company, and virtually all operational and financial targets of the integration have been achieved. For now, the deal looks to be a success. When the combined ratio is low, it usually means that the industry has enjoyed a period with few catastrophe events, allowing insurers to rebuild their balance sheets and capital. With excess capital, there is more competition to write policies, which results in pricing pressure as different providers chase growth at any cost. Up until 2017, the industry had seen modest claims since 2013 as demonstrated by the combined ratio remaining below 100%. In other words, pricing could remain under some pressure for the time being as insurers remain flush with capital (industry surplus, an indicator of insurers’ financial health, reached a record in 2017). Loss costs rise every year, so if pricing remains flat or declines even modestly, loss ratios come under pressure. Fortunately, Chubb is extremely experienced with handling underwriting cycles and runs its business to earn a profit in virtually every type of environment. Short-term pricing cycles also won't affect Chubb's long-term outlook. Advances in data analytics and digital technology could have a long-lasting impact on the industry by resulting in more efficient pricing of policies. However, Chubb seems likely to remain at the forefront of change in this area. The company is making substantial investments to become a digitally integrated organization. Management notes that a "major portion" of Chubb's annual $1 billion technology spend goes to enable its digital journey. Chubb's digital investments are very important since smaller players are gaining market share through more flexible pricing models and distribution channels. According to E&Y’s 2017 US P&C insurance outlook, digital technologies, such as social media, analytics, and telematics, will continue to transform the market landscape. For now, Chubb deserves the benefit of the doubt in these strategic areas. 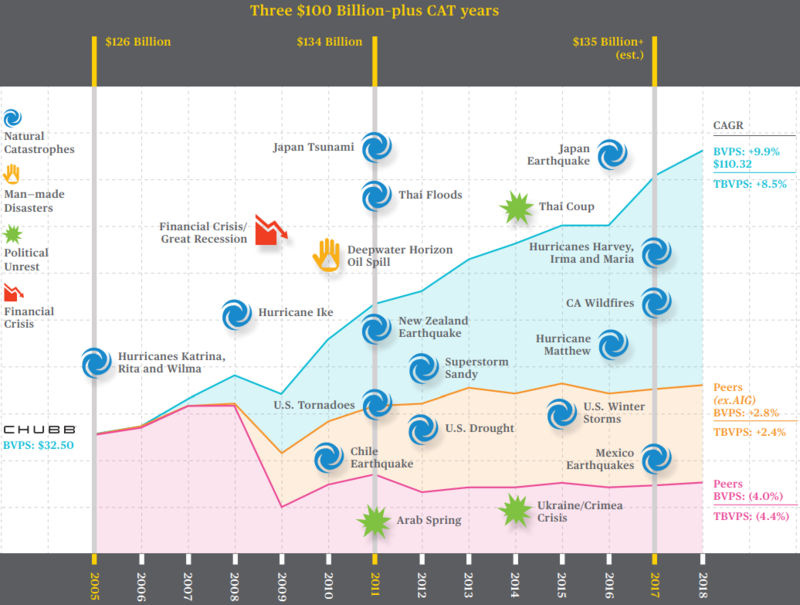 Besides industry pricing cycles and digital trends, natural catastrophe events such as hurricanes can obviously have a severe impact on near-term financial results. They are as unpleasant as they are inevitable, but Chubb has the financial health to weather just about any storm and maintains a healthy balance sheet with very strong credit ratings. As we've discussed, the company is also one of the most conservative underwriters of any insurer, and catastrophe events shouldn't affect Chubb's long-term earnings power. If anything, some catastrophe events are a healthy thing for the industry as they take capital out of the market and lead to firmer prices. Selling Chubb on news of a catastrophe event is unlikely to be a wise action for long-term investors. In fact, in the three three months following Hurricane Katrina in 2005, Chubb’s shares actually rallied more than 25%. A final key risk to consider is the impact that historically low interest rates are having on the investment income that Chubb can generate. Since over 90% of Chubb's investment portfolio is invested in fixed income securities, low rates reduce the amount of investment income the company earns. Should interest rates remain lower for longer, shareholders could be disappointed with the investment income Chubb can generate over the coming years, especially if prices for insurance policies remain under some pressure. Although it’s still somewhat early in the grand scheme of things, Chubb appears to be well on track in successfully managing one of the largest mergers ever in the insurance industry. The combined company has delivered on practically all of its operational and financial goals while completely nearly all of the integration work, positioning Chubb to remain a force in the P&C insurance market for many years to come. While market conditions have been somewhat soft in recent years, Chubb remains in excellent financial health and should continue to generate consistent dividend growth and healthy long-term returns. The company has increased its dividend for more than 20 consecutive years and should have no trouble continuing to reward shareholders with higher income.